PMBComments: On the State of Venezuela's Democracy: Jan 04/13 | On the Article "Why so much secrecy around Chávez's health? 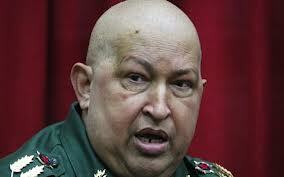 Jan 04/13 | On the Article "Why so much secrecy around Chávez's health? PMBComment | See article from CSMonitor.com below. In July 2011, during the CELAC summit in Caracas, Brazil's President, Dilma Rousseff, told a few of her colleagues - in private - that Chávez was likely to die as a result of "his excessive paranoia rather than as a consequence of his serious - yet treatable - cancer". What she meant to say was that by choosing secrecy in Cuba over medical competence at the Sirio-Libanese Hospital in Sao Paulo (where she had been treated successfully for lymphatic cancer) Mr. Chavez had condemned himself to a shorter life. My sources tell me it was Nicolas Maduro, then just the Foreign Minister, who flew to Brasilia to meet with Ms. Rousseff and her oncologist. He presented the case, as diagnosed in Caracas and La Habana; the Brazilian specialist considered it treatable under world-class protocols available in his center. Then Maduro presented the conditions for treatment in Brazil which were immediately deemed absurd and impossible to satisfy by both the physician and Ms. Rousseff. From that moment on the patient was doomed. Over the years, Fidel Castro and a handful of his closest aides have toiled hard to ensure that Chávez - whom they have always seen (and treated) as mentally unbalanced - remained completely beholden to them. By feeding him a cocktail of legitimate information gathered by their intelligence apparatus and lies and exaggerations dreamed up by Fidel himself, they made Hugo Chávez totally dependent and eternally grateful. Most of the 100,000 barrels of oil and oil products that are earmarked daily for Cuba are - medics and sports trainers notwithstanding - in return for this invaluable service which Chávez had come to consider indispensable for his survival in power. Whether it was sharing "Secret" and even "Top Secret" material extracted from different agencies of the US government, or producing bi-weekly reports of their extensive espionage within the Venezuelan military, or routinely blackmailing domestic opponents, the work of the Cubans became priceless for the increasingly paranoid coupster. As it turns out, this growing reliance on the Cubans has turned mortal for Mr. Chávez. At the same time the fidelistas in Cuba are struggling to figure out how to retain control of a country in which so much control was treasonably surrendered to them. Having seen lots of mistakes made by Fidel and his lackeys in Venezuela (i.e. assuming they could actually promote Elias Jaua - a Fidel flunky like few others - and his Cuban-trained cadres as the eventual replacements to Chavez and his revolving band of incompetent ministers), I would not bet too strongly on their success post-Chávez. They will try hard, they will fight hard, but Venezuela is so much more varied and chaotic after 14 years of chavismo that Cuba is after more than half a century of fidelismo. There are too many variables operating in Venezuela and it is because of them that secrecy has become paramount and the future looks so uncertain and even ominous. Venezuelan officials characterized Chávez's health as 'severe' for the first time last night. From dictators to leaders of Western democracies, secrecy around health concerns is often the norm. The government of Hugo Chávez has, for the first time, characterized the Venezuelan leader’s health condition as “severe” following his Dec. 11 surgery in Cuba for a recurrence of cancer. But the announcement Thursday night is unlikely to put an end to the rumor mill that has swirled in the past three weeks in the Andean country. While everyone is worked up over President Chávez's health status, his administration is not necessarily an anomaly in keeping relatively mum. From dictators who are unable to envision their countries without them at the helm, to leaders of western democracies who attempt to pursue political projects despite medical setbacks, secrecy is often the norm. “It is a long-standing pattern,” says Jerrold Post, who co-wrote "When Illness Strikes the Leader: The Dilemma of the Captive King" and is director of the political psychology program at George Washington University. Norm or not, the lack of news has kept people talking. Type in #DiganLaVerdadSobreChavez, or #TellUsTheTruthAboutChavez, and the trending Twitter topic reveals the state of speculation that has become the state of Venezuela since Chávez traveled to Havana for treatment last month. No one has heard from him since. The opposition, for their part, is outraged, demanding more specificity, that the Venezuelan people be told the “whole truth” of the status of the country’s leader. What does secrecy tell us? From former US presidents Ronald Reagan to Franklin Roosevelt, the states of health of leaders was carefully curated by administrations. In one oft-cited case, French President Francois Mitterrand hid his cancer diagnosis from the public for over a decade before being forced to step down. “Yet every year the doctor dutifully said he was in fine health,” says Dr. Post. In some cases the secrecy reflects different historical social mores about privacy and the public's right to information. And in many cases it was also an effort not to minimize a leader’s mandate. But in an age of social media, such secrecy is not tolerated – or even possible. The recent health statuses of other Latin American leaders facing illness, for example, including the presidents ofParaguay and Brazil, have been promptly released to the public. In fact, Pedro Burelli, a former member of the executive board of Petróleos de Venezuela and today a political analyst in Washington who is critical of Chávez, says that the leader chose treatment in Cuba, where there is no free press, for the guarantee of secrecy. “The natural tendency would have been for him to go to Brazil,” Mr. Burelli says, as it boasts among the best cancer treatment centers in Latin America. It’s also where other leaders in the region have been treated. But in a democracy with a robust press, Burelli says, “Chávez feared that information [about his condition] would filter out.” Instead, he chose "sub-optimal care" in Cuba, in Burelli’s opinion, in order to keep his medical condition tightly concealed. In fact, Fidel Castro temporarily stepped down in 2006 and permanently in 2008, after his own health crisis was disclosed only as an intestinal problem and has been a “state secret” ever since. Over the years, Twitter has alighted with speculation of his health, especially after a long period out of the spotlight. Inevitably he has appeared again, either on television or with his name on a written column in the state-run Granma newspaper. Mr. Pope says that in the case of leaders such as Castro or Chávez, the secrecy is linked to an inability to imagine their countries without them. “We are talking about [an individual], who has totally entwined his own identity with that of Venezuela,” Pope says. It is possible that the newest announcement on Chávez’s health status by Venezuela’s Minister of Communication and Information, Ernesto Villegas, represents a move toward transparency on the part of the government. But now Venezuelans are speculating why he made the announcement. And he also failed to mention the scheduled Jan. 10 inauguration of Chávez, who won a fourth term in office in Oct. 7 elections. Instead, Mr. Villegas condemned the "psychological war unleashed by transnational media about the health of the Head of State, with the ultimate goal of destabilizing the Bolivarian Republic of Venezuela,” he said. Twitter accounts are likely to stay as active, and as speculative, until the government gives more clarity.